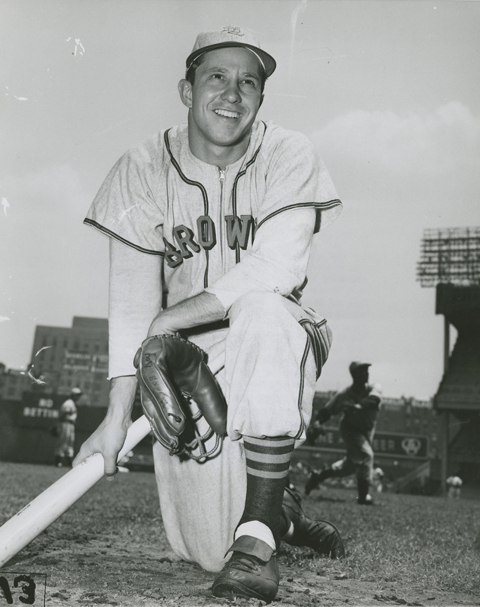 A couple of a favorite player, Harlond Clift. I like the rolled lace web on that big Rawlings glove. Roy Sievers with the same type web. Must have been really popular back then. Lots of photos out there with players using that "outlaw web." Last edited by okdoak on April 24th, 2017, 11:50 pm, edited 2 times in total. Minnie Minoso, Jim Landis, Luis Aparicio, and Nelly Fox with their 1960 Gold Glove awards. Brooks R. with a Big 8 style web, circa 1964. I don't think you could get one like his at your local sports store. Last edited by okdoak on April 24th, 2017, 11:38 pm, edited 1 time in total. 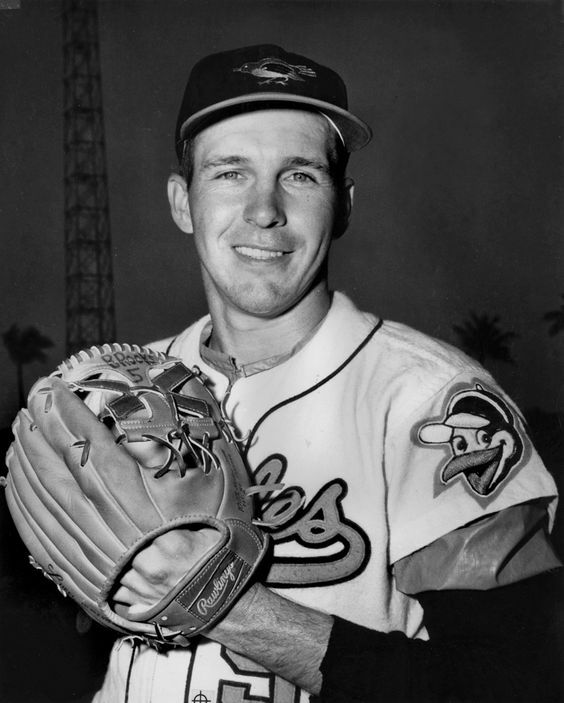 Cool photo of Robinson with the V-anchored "Double X Web" Rawlings glove. I have not seen that photo before. 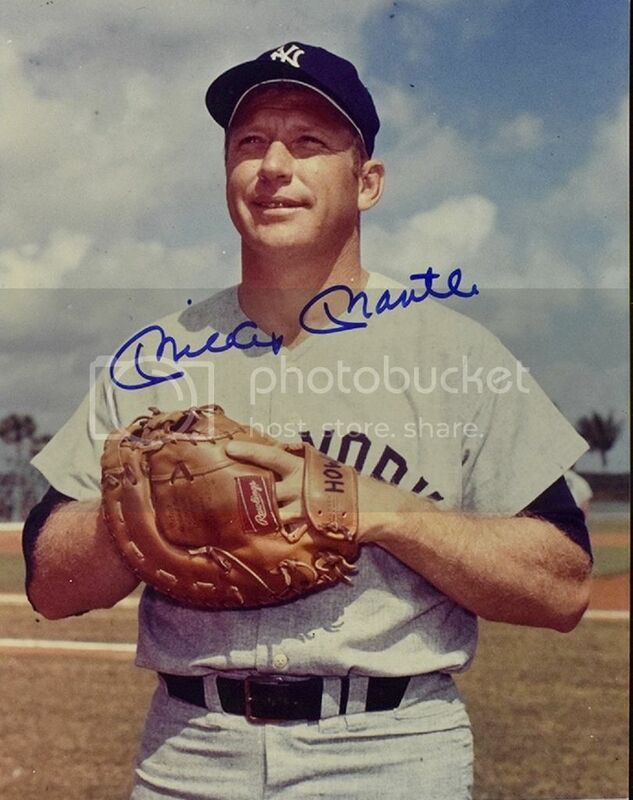 Here's a nice one of Mantle circa 1967. He is wearing the DCT model base mitt of team mate Elston Howard. Note the "HOW" on the wrist strap. Besides catching, Howard spent time in the outfield and first base. Last edited by atabats on April 25th, 2017, 3:28 pm, edited 1 time in total. And I thought 1940's MacGregor Goldsmiths were big. Best chair I've seen in a long time. Beautiful and looks super comfy. Jimmie Foxx and Joe Cronin at spring training camp in Sarasota, 1936. It's a low-res image so it's tough to figure out whether Cronin's using a Victor, Reach or D&M model. Last edited by atabats on May 14th, 2017, 7:45 pm, edited 1 time in total. I would guess it's a Reach. A beautiful, mint glove. The D&M and VWD gloves had cloth patches more toward the middle of the wrist strap. A lot of joking around during spring training. Maybe it's a Rainey Trap and we just can't see the grommets? A pure white one Whatever it is, it's absolutely beautiful. 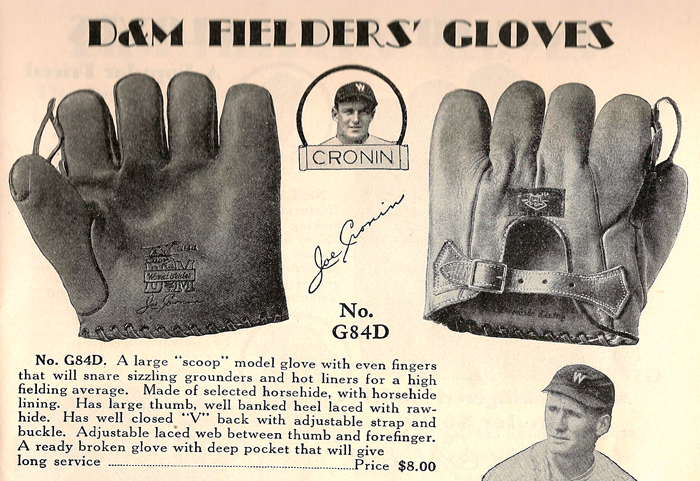 He endorsed a Reach glove at that time along with one of D&M's top line gloves. I guess the Babe was old school, too. 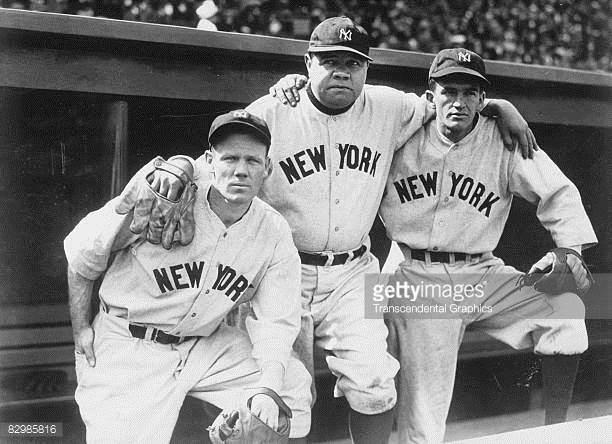 This is from 1934, his last year with the Yankees. Love this thread. It made me want to go back through all my old cabinet photos. Found a couple more good ones. This catchers set made me think mine could be a catchers glove. This is the first shoulder heel scar lace glove in a pic I have ever seen. Didn't even know I had it! Those are two great early glove photos JD....nice eye!! It is truly amazing what you can find when you actually take them out and look at them, huh JD?!? !